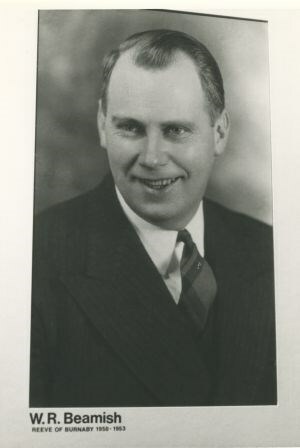 Photograph (mounted and titled) of William R. Beamish, Reeve of Burnaby from 1950 to 1953 and Council member from 1943 to 1950. 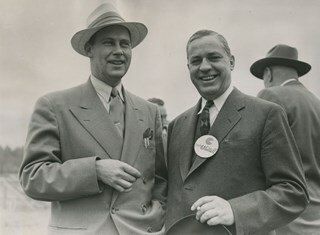 Photograph of the President of Continental Can Co. of Canada Ltd., Frank A. Whittall with Burnaby Reeve, William Randolph Beamish at the ground breaking ceremonies of Continental Can Co. of Canada Ltd. Both men are wearing suits, but Reeve Beamish is also wearing a straw fedora. 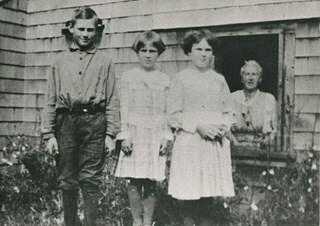 Photograph of the Beamish family.William Randolph "Ran" Beamish (long-time Reeve of Burnaby later on); Ilma Beatrice Beamish (sister); Ethel Agnes Beamish (sister); (in window in background) Mrs. Agnes Beamish (mother). The photograph was taken in front of the family home at 277 17th Avenue (later renumbered 8059 17th Avenue) in East Burnaby. 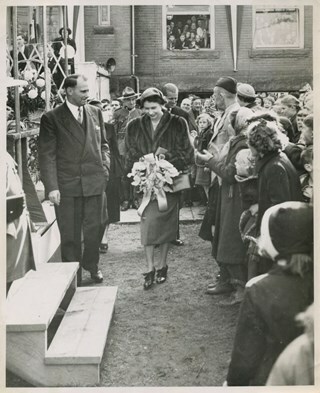 Photograph of Reeve Beamish and Princess Elizabeth at the Municipal Hall at Kingsway and Edmonds Street. Her bouquet is made of orchids from Burnaby Orchids Ltd. 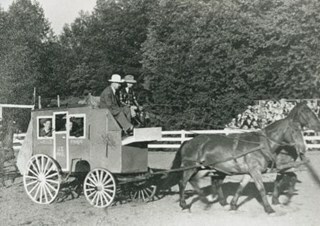 Photograph of Prime Minister Louis St. Laurent's visit to Burnaby. 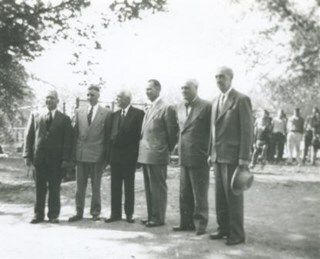 Left to right: N.D. MacDonald (principal of Burnaby South High School), Tom Goode (MP for Burnaby), Prime Minister Louis St. Laurent, Reeve William R. Beamish, Bill Guive (chairman of the Burnaby School Board), and George Morrison. Photograph of the Beamish family; ten year old Randolph, seven year old Ilma (later Dunn) and nine year old Ethel (later Derrick) standing in a row outside their family home at 277 17th Avenue (later renumbered 8059 17th Avenue). Agnes Beamish is at the far right looking out the pantry window from inside the house. Note on verso of photograph reads: "Summer of 1919 Randolph 10 / Ethel 9 / Ilma 7 /The Beamish children with Mother at Pantry Window"
Photograph of the Beamish family standing in front of their family home at 277 17th Avenue. From left to right, they are; Randolph, Ilma (later Dunn) , Ethel (later Derrick) and their parents Agnes and William John Beamish. Note on verso of photograph reads: "The BEAMISH HOME on 17th Ave. and The Family - 1919"
Photograph of eight men identified as Burnaby's Municipal Council sitting and standing on a stone staircase outside an unidentified building in Victoria. 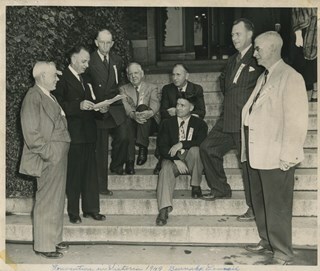 Written across the bottom of the photograph is: "Convention in Victoria 1949 Burnaby Council." Identified in the picture are Reeve George Morrison (third from the left), Charles MacSorley (fifth from the left, seated in back), Doug Drummond (seated in front of Charles MacSorley) and William Beamish (second from right). 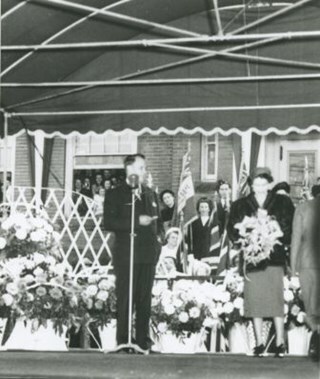 Photograph of Princess Elizabeth and Prince Philip being greeted by Reeve Beamish on the stage in front of the Burnaby Municipal Hall at Kingsway and Edmonds Street. 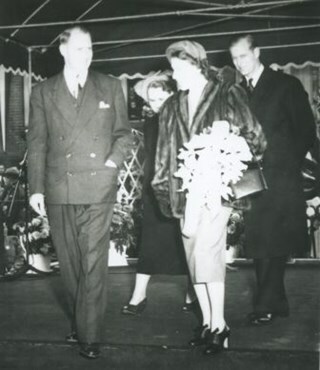 Photograph of Reeve Beamish, Princess Elizabeth and Prince Philip at the Municipal Hall at Kingsway and Edmonds Street. Her bouquet is made of orchids from Burnaby Orchids Ltd. 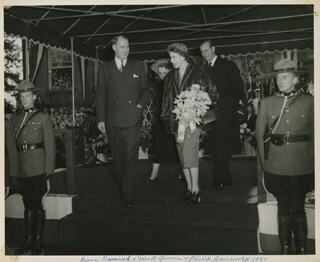 Photograph of Princess Elizabeth's 1951 visit to Burnaby. Reeve William R. Beamish and Princess Elizabeth are seen with a crowd outside Burnaby Municipal Hall at Edmonds Street and Kingsway. Prince Philip can be seen standing behind the Princess. 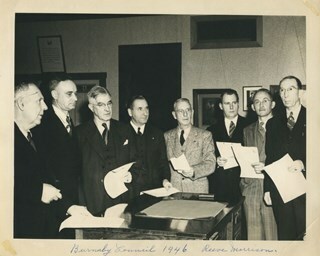 Note on verso reads: "Corporation of Burnaby 1951"
Photograph of the eight members of Burnaby's Municipal Council standing in an office, each holding a piece of paper. Written across the bottom of the photograph is the caption: "Burnaby Council 1946 Reeve Morrison". Reeve George Morrison can be seen to the far right. Third from the right is William Beamish, fifth from the right is Charles MacSorley and at the far left is Joseph Gartlan. The rest are unidentified although the remaining members of the 1946 Council were James West, William Philps, John Jones and Harry Ball. 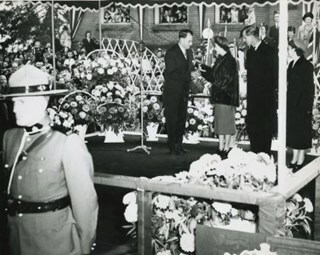 Photograph of Reeve Beamish and his wife (left) walking with Princess Elizabeth and Prince Philip on the stage set up at Burnaby Municipal Hall for the 1951 Royal Visit. Two Royal Canadian Mounted Police are standing on either side of the steps to the stage. Caption on recto reads: "Reeve Beamish & Mrs B. Queen & Philip Burnaby 1951"